I first gave the dresser top a light sanding. 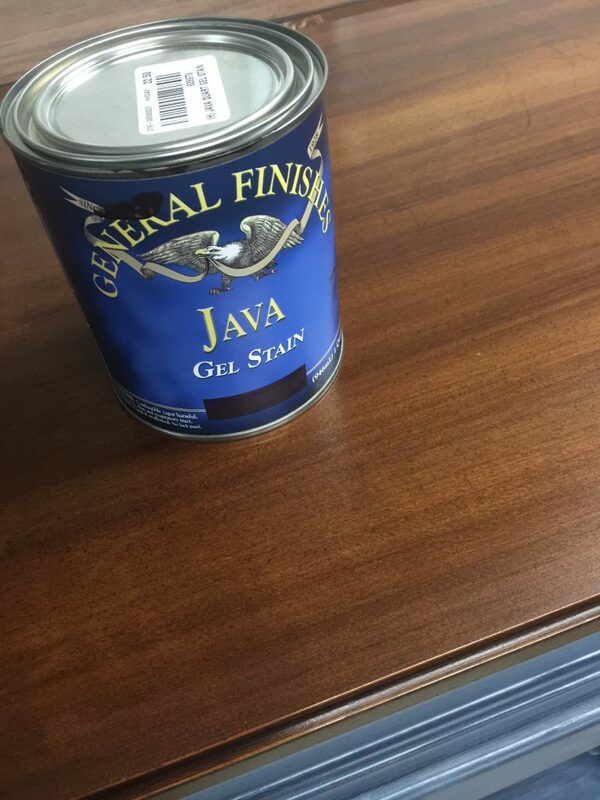 I then applied two coats of General Finishes Java Gel Stain , which is pure magic. It’s easy use … just brush on … wipe off … let dry. It has changed my view on stains, which has never been my strong suit! This needed to dry overnight so I began the work on the “white lime wax” wash that my customer requested. She wanted what she referred to as a “glacier” effect. We decided together that a rich deep blue washed in white would do this. 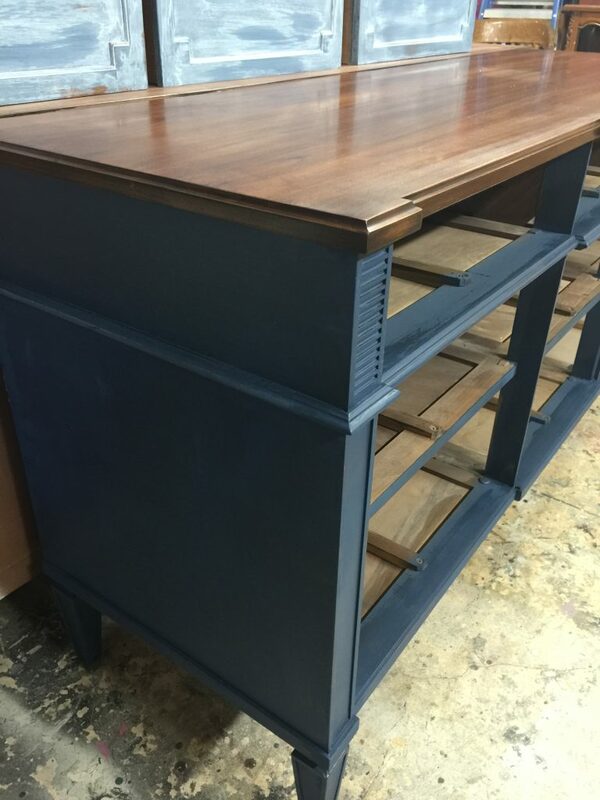 So I covered the body and drawers of this dresser in Heirloom Traditions Naval. I’m not a huge fan of navy….but this color is just gorgeous! Here it is in the photo next to the spray wax that is about to rock my world in a challenging way! 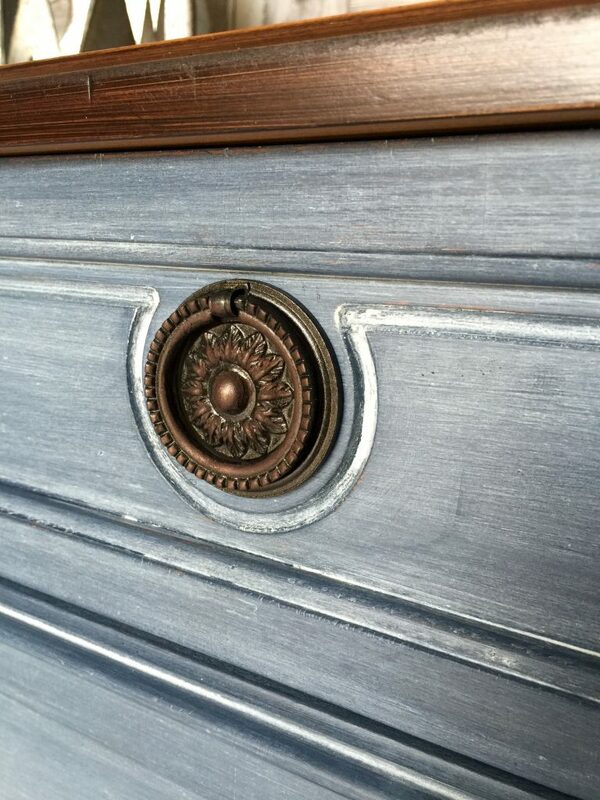 And this shows the dresser in Naval with the gel-stained top. I have NO IDEA why I chose to keep going…but I did an entire row of drawers!!! THREE drawers!!! What was I thinking? Clearly I wasn’t! Ok … time to regroup! Its grabbing to much … sucking into the dark naval before I have time to work with it! 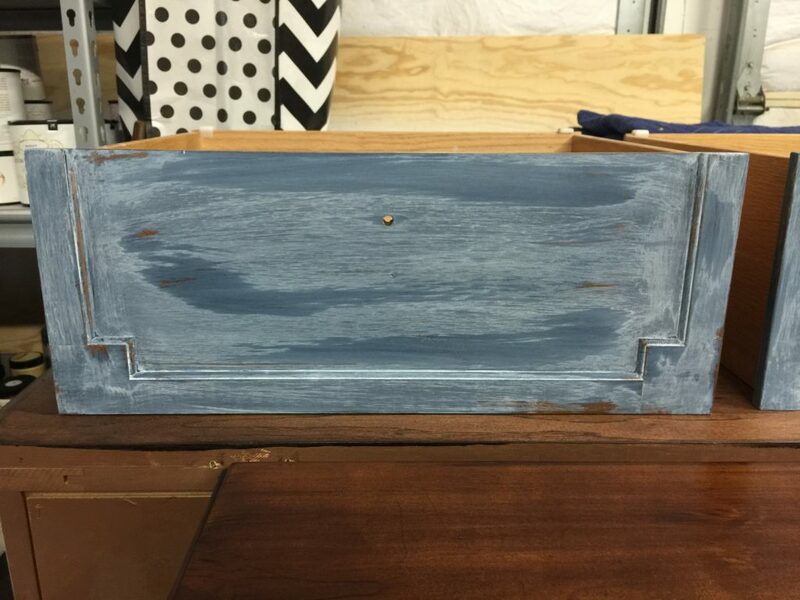 I decided I needed to seal the chalk paint first! This would create a barrier to the chalk so it wouldn’t soak right in and would be more of a team player with me for the look that I was after. Now … don’t get me wrong here! White Lime Wax looks great on many colors when it soaks into the paint. I’ve used it on pale pinks, sweet lavenders, yellows, light grays … and it was a gorgeous look. But this dark Naval and the SPRAY white lime were not having it! So I sealed the remaining six drawers. Since I am now “spray bottle” shy … I opted to spray my wax into a bowl…and brush the liquid wax on lightly … and then rub with my clean cloth. And this my dear friends was the ticket! We have a winner! I have posted the picture below of the original drawer … the “challenged drawer” and the “perfect drawer”! So all drawers are completed and the body has been finished in the same way! And I’m a happy camper! 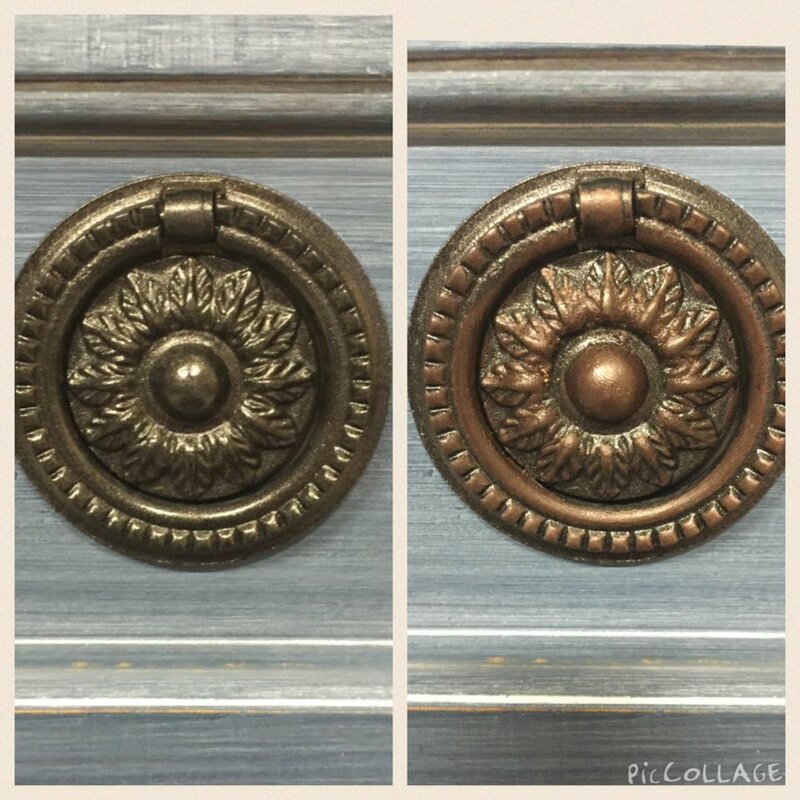 My client liked the hardware on this piece but it’s original finish was to brassy for the fixtures she had going in. 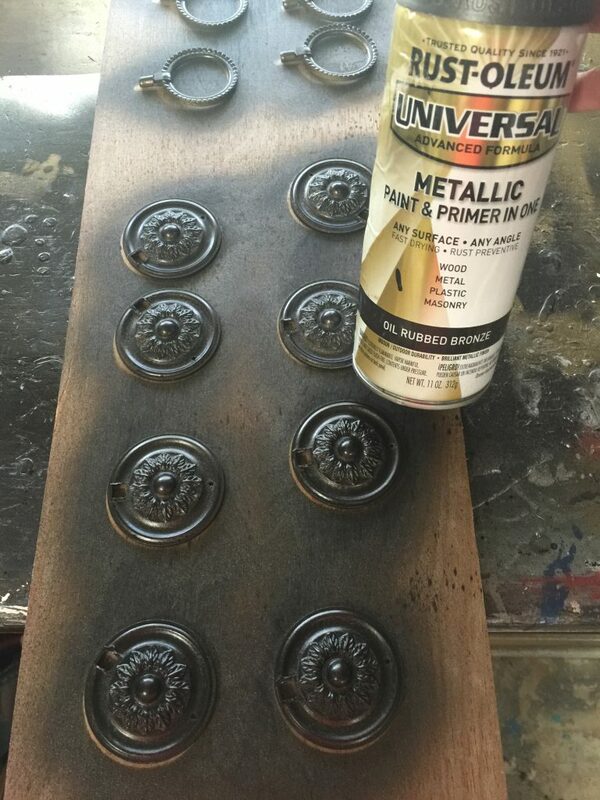 So I opted to spray them with my favorite hardware spray ever … Rust-Oleum Metallic Finish Spray Paint, Oil Rubbed Bronze . 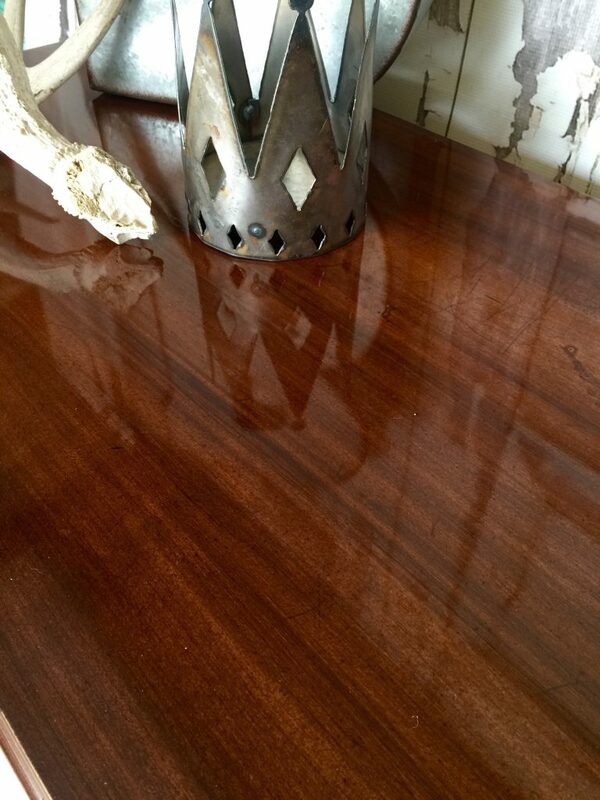 But this finish was just too dark in comparison to the color of the top wood surface. So I decided to rub them down with a little Rub ‘n Buff Copper . It was just what was needed….the perfect tone! This next pic shows a before (left) and after (right). 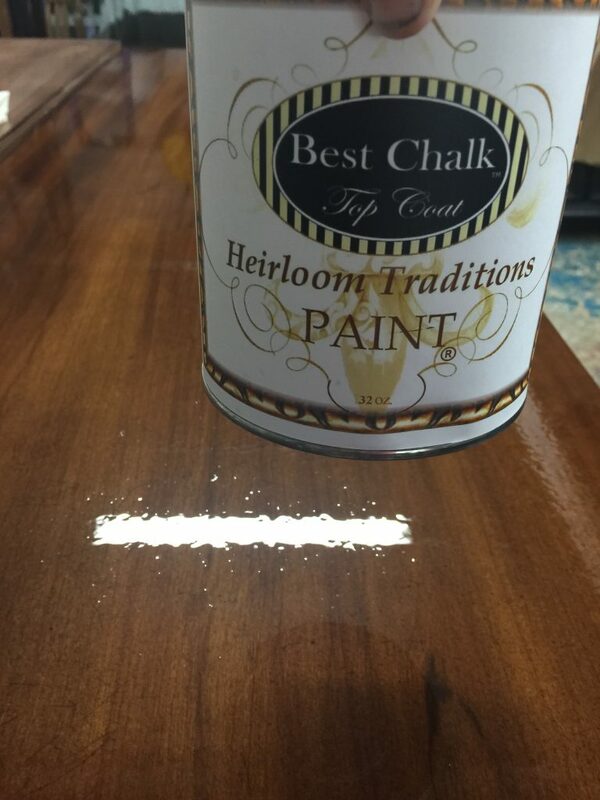 Now to apply Heirloom Traditions waterproof Best Chalk Top Coat to the surface to prepare it for bathroom use. This stuff is like liquid gold! It does have an odor so make sure you use it in a well ventilated area. It also is naturally golden so it will change the color of lighter paints and may even yellow over time. 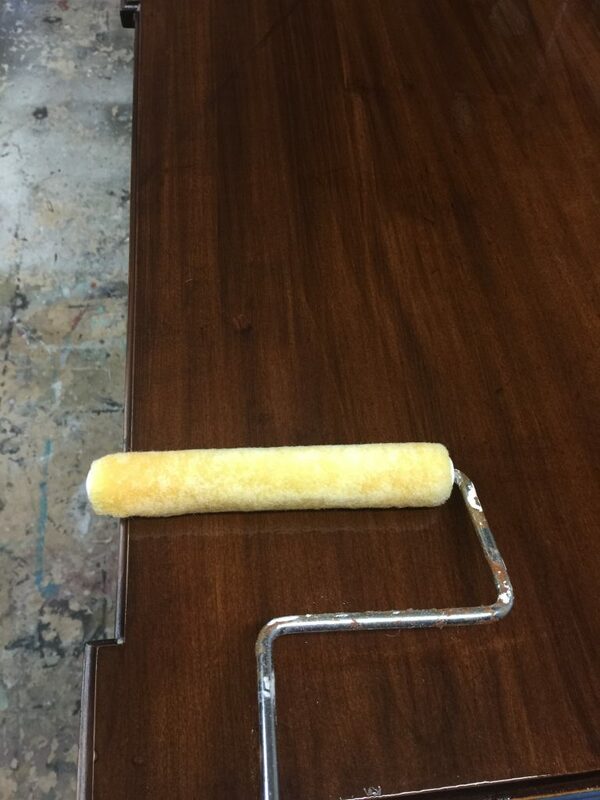 It is best used on dark colors or stained wood for a very durable surface! I chose to apply it with a roller and it went on like a champ! I allowed about six hours of dry time before I applied the second coat. Within 24 hours it was as hard as a rock and so gorgeous! So we dressed her up and had a little photo shoot! I am thrilled with the outcome! And even more thrilled that I have now used the spray wax and I love it! I seriously prefer the liquid to the paste. 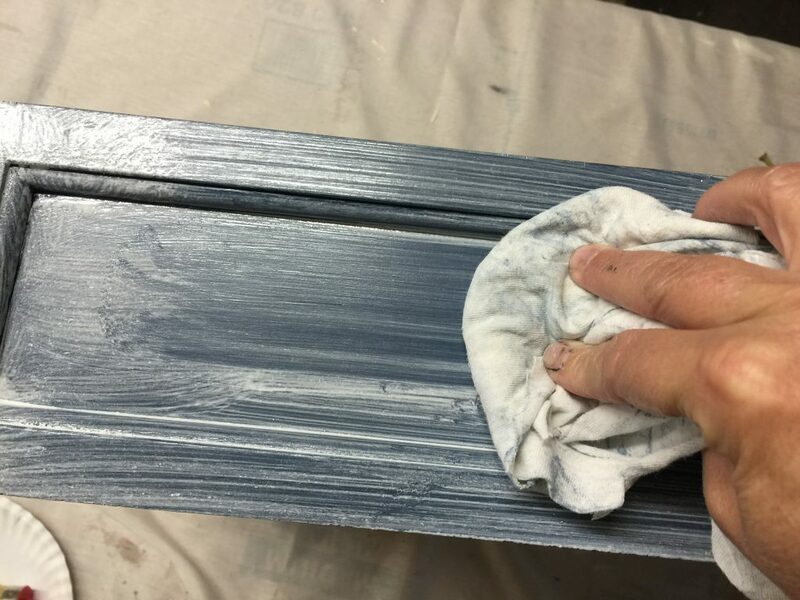 It is so much easier to work with….less elbow grease….when you don’t mess it up the first time around! So remember……if you want a light wash over a dark color and you don’t want it too splotchy…..
First paint. Then seal. Then spray wax. For MANY more colors of spray wax options, check out at Heirloom Traditions Online and use the coupon code FANCY to get 10% off and help me earn fabulous free paint supplies! And please don’t hesitate to shoot us a question or comment about a DIY project that you want to tackle! I am always excited to support others on their painting journey! 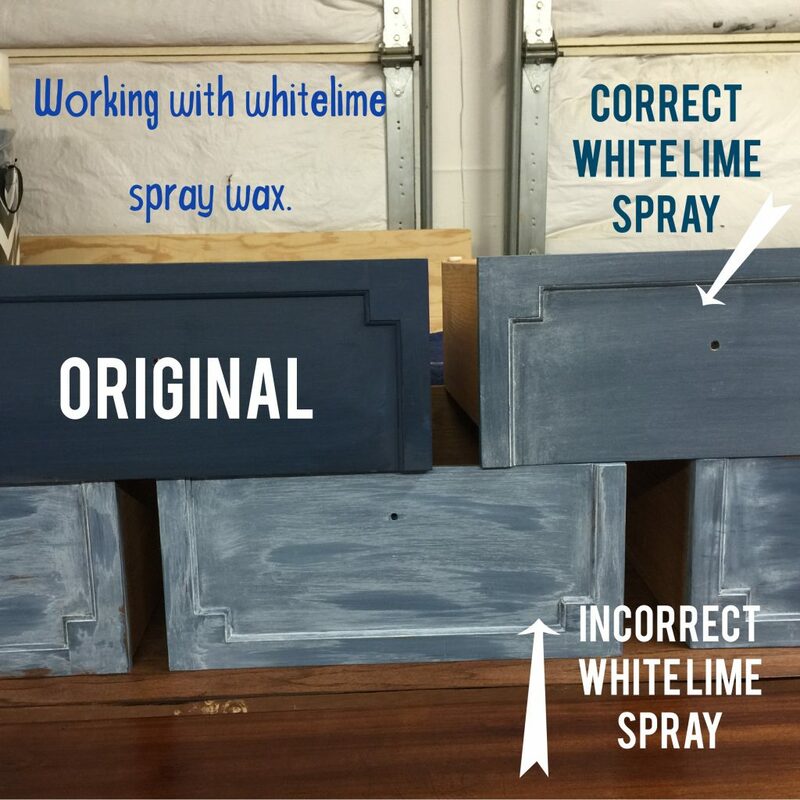 Please pin my White Lime Spray Wax Tutorial to Pinterest! 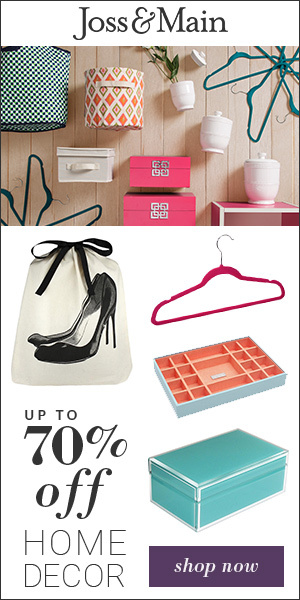 Subscribe to my blog and follow me on Pinterest. Please and THANK YOU! Love the look you achieved! I just used the Kingdom Gold Spray Wax for the first time, and I love it. Thanks for sharing your challenges, and your Triumph! Thanks for commenting! I’d love to see what you did with the kingdom gold spray wax!! Wanna share it? If you can’t attach it here….post it to my Facebook! 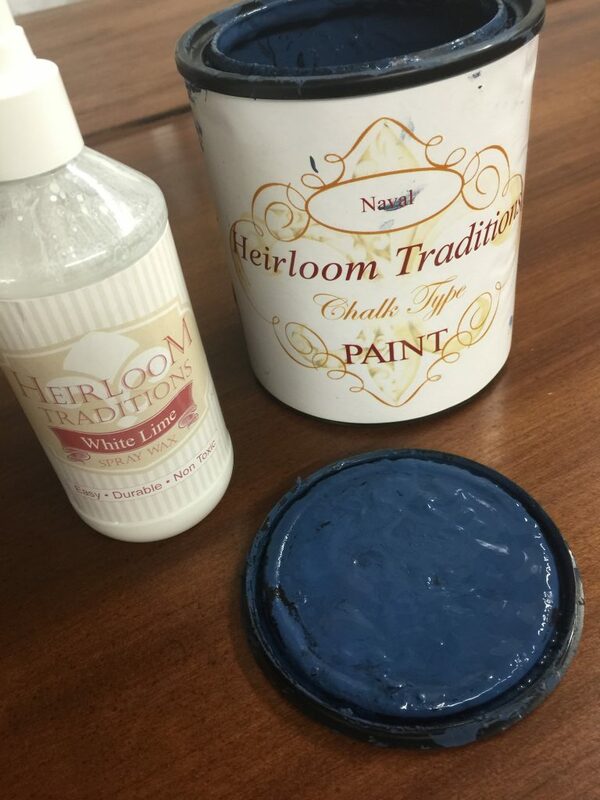 What did you use to seal the chalk paint before applying the lime? 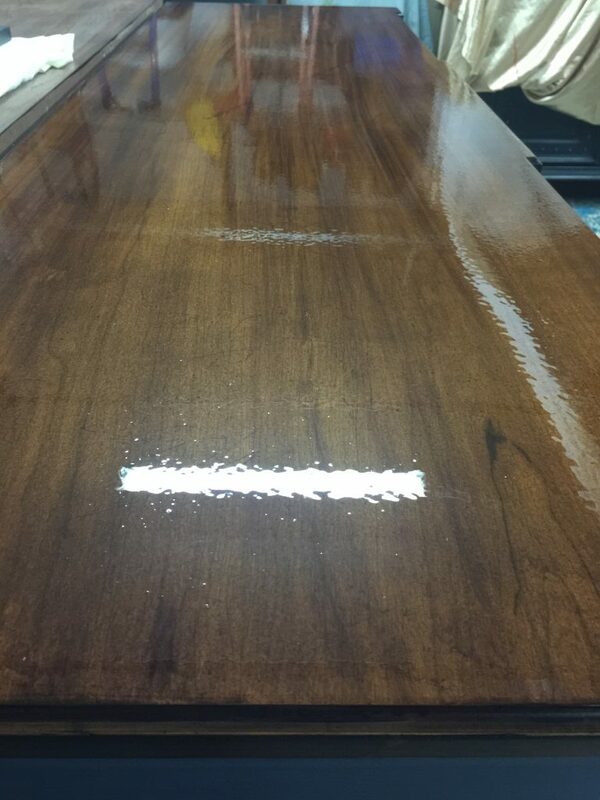 I used a sealer by General Finish. But any water based sealer will work. And you don’t have to apply it painstakingly. Just slap it on and let it dry. Good luck!! What are you using to seal it before using the wax? I’m new to this so I need all the information I can get. Thanks! Hi Barbara, that’s seems to be an important part that I left out as I’ve had so many people ask. I used A General Finish sealer. But any water base sealer will work. And I don’t apply it perfectly. I litterally just give it a quick coat and it dries very quickly. I hope this helps! I’m happy to answer any questions you encounter. Thumbs up for tackling this while being a rookie! Let me know how it goes! I love the way the top came out. Personally, I am not a fan of the lime spray on the navy, but all that really matters is that your client is happy. What do you recommend for a sealer on wood where yellowing would be an issue?